With today's smaller family size, it can be difficult to find large quantity recipes. You can always convert a recipe for 4 or 6 by doubling some ingredients, but that doesn't work in every case. The recipes below are all designed for eight or more people. These recipes are great for big families, special events, potlucks, or for dinners with guests. Whether for a party or family meal, you're sure to find the perfect recipe on this list. All Day Crockpot Beef and Beer Stew This stew is flavored with onion, some beer (or beef stock), and garlic. It is a simple, budget-friendly recipe and it serves at least 8 people with rice, noodles, or potatoes. Simple Beef Tips These beef tips are easy to fix and offer loads of flavor. Condensed beef broth helps make a delicious gravy. Serve beef tips over hot cooked rice or mashed potatoes. The recipe makes 8 to 10 servings. Roast Beef Tenderloin With Red Wine Sauce This is a great choice if you're looking for something extra-special. The whole beef tenderloin will serve at least eight people, and the red wine sauce is amazing. Basic Meatloaf With Optional Topping A meatloaf is always a good choice for a big family. A standard meatloaf will easily feed eight, and you might consider making meatloaf muffins or sliders for the kids. Oven Fried Chicken With Cornflake Crumb Coating Whole chicken legs are easy on the budget and taste great. These chicken legs are baked to perfection with a crunchy cornflake coating. Perfect Spinach Lasagna This lasagna proves it doesn't have to have meat to be hearty and satisfying! This vegetarian lasagna will be an instant hit with your friends and family. Chicken Tetrazzini Casserole Chicken and cooked spaghetti team up in this popular casserole. This is a classic casserole and can be made with chicken or turkey. Orange Glazed Turkey Breast A large turkey breast will yield enough lean meat for 8 to 12 people. Count on about 2 1/2 to 3 servings per pound of bone-in turkey breast, or up to 4 servings per pound of boneless turkey breast. 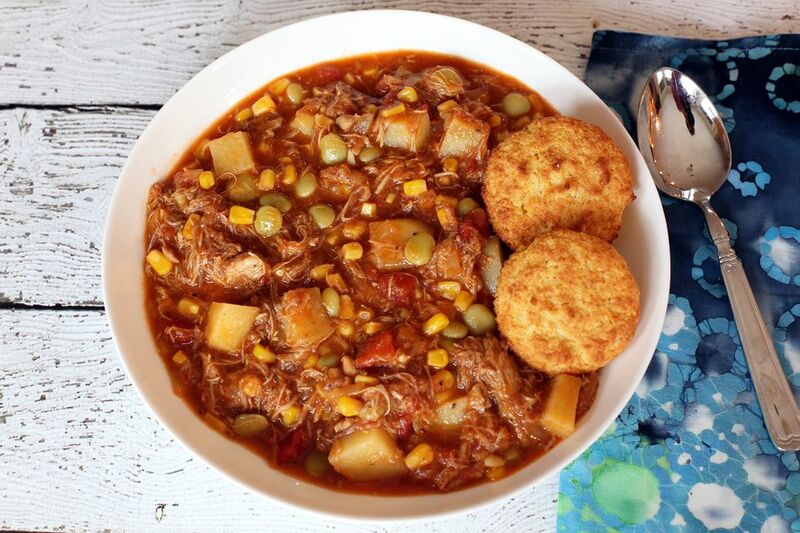 Classic Brunswick Stew With Pork and Chicken This classic stew is perfect for a big family or large gathering. Serve it with cornbread and coleslaw, or as a side dish at a big barbecue event. Favorite Meaty Lasagna This meaty lasagna will feed at least eight people. It's filled with ground beef, Italian sausage, and three kinds of cheese. Beaufort Stew Also known as a Low Country Boil, Frogmore stew, or simply a shrimp boil, this is a classic combination of shrimp, smoked sausage, small potatoes, and corn on the cob. The ingredients are cooked in a big stockpot, often over a campfire. Crockpot Sloppy Joes This classic American sandwich recipe makes a big batch, and it's easily scaled up for a bigger crowd. Serve the sloppy Joe mixture in split toasted buns with French fries or chips and coleslaw. Slow Cooker Pulled Chicken This pulled chicken uses a mixture of chicken breasts and chicken thighs for a moist and juicy sandwich filling. If you're short on time, use a bottled barbecue sauce instead of homemade. Hearty Slow Cooker Chicken Chili Lean chicken breasts, a variety of beans, and spicy seasonings make this a hearty and flavorful chili the whole family will love. It's great for parties as well. Serve it with freshly baked cornbread. Breakfast Casserole With Sausage, Eggs, and Biscuits This casserole makes a big family breakfast a snap to fix and bake. Loaded Pizza Pasta Casserole Who wouldn't be happy with a hearty pasta casserole that tastes like a big, loaded pizza? This casserole is perfect for a family meal. Crockpot Macaroni and Cheese This recipe makes enough creamy macaroni and cheese for eight people. Vary the cheeses or add some bacon or diced ham. Ziti Casserole With Ground Beef and Mushrooms This crowd-size ziti bake is filled with ground beef, fresh sliced mushrooms, and lots of melty cheese.